Duluth’s first building made with bricks, Branch’s Hall, was constructed in 1870 by William H. Branch with the financial help of pioneers Sidney Luce and J. D. Ray. The two-story red brick structure had arched windows on the second floor, stone quoins on the corners, and a bracketed cornice (pictured between Elevator A and the first Portland School, shown photographed under construction in the 1870s). Branch, a native of Ohio, moved to St. Paul in 1852 and served on its city council and in the state legislature. In the late 1860s, he moved to Duluth as a director of the Lake Superior and Mississippi Railway. 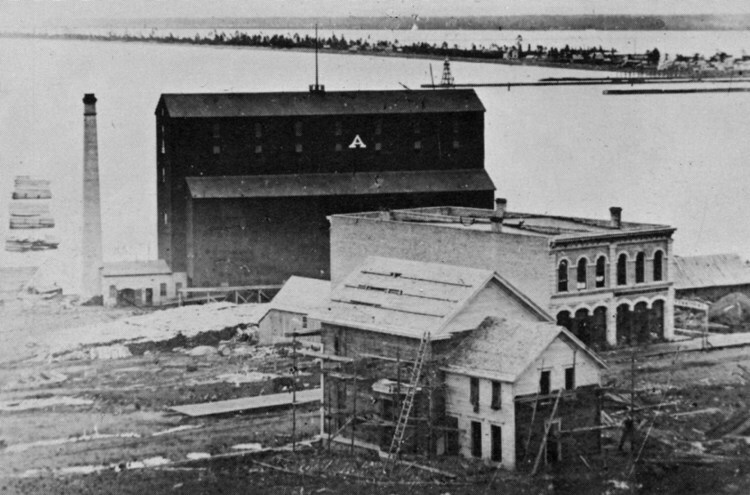 The railroad produced Duluth’s first boom, and Branch bought up land and built his hall. He died only two years later and his family moved back to St Paul. In its early days, Branch’s Hall served many functions: Duluth’s first public hall, a school, and home of the Grand Army of the Republic (the Union’s Civil War veterans’ association). It served as a meat packing plant in the late 1880s and a feed store in the early 1900s. In 1915 the buildings’ second floor was converted into the club room and dance hall for the Duluth People’s Society. At one point it was painted white, covering most of its architectural details. From 1919 until it the 1980s it was an auto dealership and, finally, the General Trading Company, which sold auto parts. Branch’s Hall was razed in 1986 for the Interstate 35 eastern expansion.